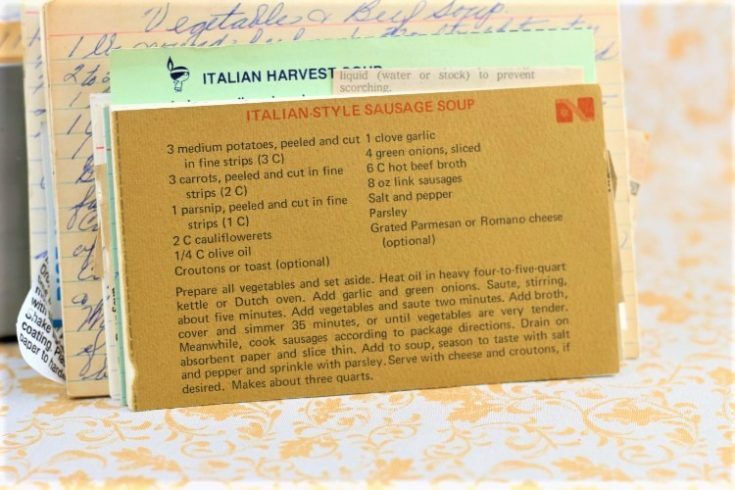 Front of the recipe card for Italian Style Sausage Soup. There are lots of fun recipes to read in the box this recipe for Italian Style Sausage Soup was with. Use the links below to view other recipes similar to this Italian Style Sausage Soup recipe. 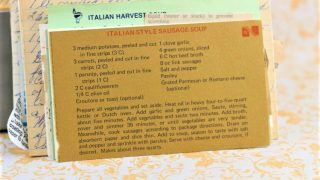 If you make this Italian Style Sausage Soup recipe, please share your photos and comments below! Heat oil in heavy four-to-five-quart kettle or Dutch oven. Add garlic and green onions. Saute, stirring, about five minutes. Add vegetables and saute two minutes. Add broth, cover and simmer 35 minutes, or until vegetables are very tender. Meanwhile, cook sausages according to package directions. Drain on absorbent paper and slice thin. Add to soup, season to taste with salt and pepper and sprinkle with parsley. Serve with cheese and croutons, if desired.